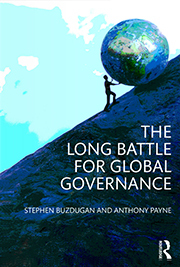 A new book, The Long Battle for Global Governance, by SPERI Director Tony Payne and Stephen Buzdugan is published today by Routledge. The book charts how largely excluded countries, variously described as ‘ex-colonial’, ‘underdeveloped’, ‘developing’, ‘Third World’ and lately ‘emerging’, have challenged their relationship with the dominant centres of power and major institutions of global governance across seven decades from the 1940s through to the present day. In The Long Battle for Global Governance Tony, and his co-author Stephen Buzdugan, provide a new perspective on global governance and focus on how these countries have organised themselves politically. They analyse the current rise of countries such as Brazil, China, India and South Africa to their new positions of prominence within key global institutions, notably the G20. The authors set this important political shift against the wider history of longstanding tensions in global politics and political economy between so-called ‘Northern’ and ‘Southern’ countries. The book is available for purchase from Routledge. Stephen Buzdugan is Senior Lecturer in International Political Economy at Manchester Metropolitan University and Tony Payne is Professor of Politics and Director of SPERI. Buzdugan and Payne have done the study of global governance a huge service, supplying in their new book an unusually thought-provoking consideration of where we are now and how we got here. Written with immense clarity of thought and argument, and combining wide sweep and careful detail, readers will ﬁnd here a fresh and challenging take on the evolution and the politics of global governance, which deserves our fullest attention as we navigate what they call the ‘ Great Uncertainty ’ of the contemporary period. This co-authored book is an academic tour de force. The work is impressive both in its thematic reach and rich detail. Key Events|News over the last seven decades are reconﬁgured in terms of the evolution of global governance, with a careful eye to the struggles still ahead. In an era of uncertainty, Buzdugan and Payne oﬀer clear insights about the historical record and recommendations concerning future advances. Buzdugan and Payne have written an authoritative and comprehensive account of the shifts of power in the global order that both underpin global governance and reshape it. Tracing the changing nature and form of global governance since the 1940s the book provides an ideal text for all those who wish to explore the reorganisation and contestation of global politics.